Last Saturday was a bad weather day that turned into cookie baking day. The driveway was covered in ice, the holiday party plans we had were cancelled, it was just a disgusting day outside. 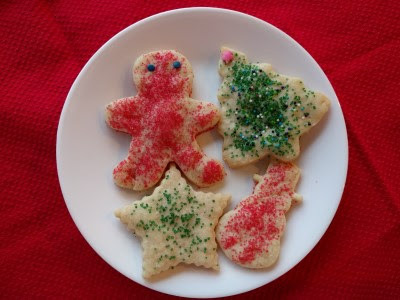 But inside, we were baking cookies and sipping tea while sampling the finished results. 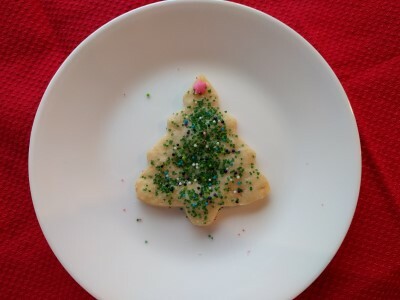 Since we had unexpected extra time, we decided to make the same butter dough as the Cherry Chocolate Hazelnut Cookies but turn it into cut out cookies decorated with sugar, not glaze. Neither of us really likes glaze on cookies. The dough is pretty easy to roll out. Our "problems" were that we got new cookie sheets that are lighter in color/aluminum and all our other cookie sheets are dark, non-stick metal. They definitely bake differently. We kept extending baking times on the new, light colored cookie sheets, sometimes by quite a bit, but then sometimes we'd forget to decrease the time again for the dark sheets and leave those cookies in too long. It was a little frustrating. Some of the light sheet cookies are baked but not as much/as golden brown as we would like. So I'm not sure if I'm lukewarm about these cookies because we weren't baking them long enough or if it's the cookie itself. I'm pretty sure it's the former. Plus, if you let your husband decorate, sometimes you get creepy looking cookies. 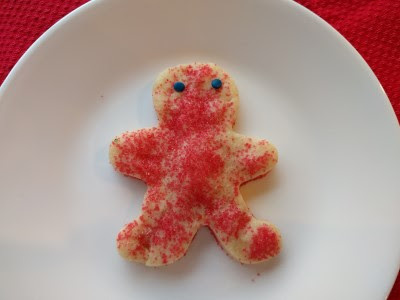 This red guy looks like he could sneak in and murder you. He also has a puffy potbelly. I wanted only stars and bells, but nooooo we just had to use the gingerbread man cutter. Now we have creepy cookies.